The day started off overcast, no rain thankfully, just lots of clouds as we set off in the Opel for the cliffs of Cabo de São Vicente. Along the way, a mosaic of plates on a building bordering the road caught our eye. We pulled over and stepped into a massive warehouse filled to the brim with pottery of all shapes, sizes and colors. Overwhelmed, we wandered the aisles before finding a few souvenirs and gifts to take home. Our next stop was Cabo de São Vicente, a quaint seaside town built into the hillside that is officially the southwesternmost point in Portugal. We spent an hour walking around but with the wind picking up, decided to cut our time short and get back on the road. It was another 45-drive to Lagos, a rapidly developing beach city, and home to our hotel, the Villa Gale Lagos. This was a sprawling hotel, with the requisite weird and trendy lobby that characterizes many of the places we decide to stay. Outside was a massive pool. We’re talking three or four interconnected pools and perhaps 200 chaise lounges. Thankfully, the place was practically deserted so we settled in. We grabbed a late lunch at a British pub a short walk down the beach – it was so good that we tried to return for dinner. Unfortunately, it was closed, and the seafood joint our hotel recommended didn’t look great (we were seated, looked at the menu and promptly walked out). We ended at a local Italian place in town. Super casual and not particularly tasty. Oh well, you can’t win them all! Dawn was almost magical this morning. We awoke to chirping birds outside of our window and the sun rising over rolling vineyards for as far as the eye could see. We fueled up on a big breakfast of eggs, toast and jam as we prepared for a day’s drive of traversing Portugal. It would be a good 6-hours from Porto south to the Algarve, our destination. Setting out a little after 10 am, the roads returning to Porto didn’t seem nearly as treacherous. In fact, highways here in Portugal are in nothing short of perfect condition. Nicely leveled, newly paved, bright lane markers. And no cops, which meant that we watched much of the country whiz by, only stopping occasionally for gas, snacks or one of the many tolls. As we entered the Algarve, which is more broadly defined as the Southern coast of Portugal, the landscape quickly changed to a rocky coastline, akin to New England. Finally, we arrived in Sagres, a small town nearly at the southern tip of Portugal. Checking into our hotel, the Memmo Baleeira Hotel, we could have been in South Beach. There were lots of weird artifacts in the lobby that Lottie played around with, including these cool lights. We threw our stuff down in the room, grabbed a couple of beers from the minifridge and made our way to the hotel’s sprawling back lawn. This is what we have traveled all day for. It was another beautiful morning — sun shining, not a cloud in the sky — as we walked to a café across the street for bicas and chocolate croissants heated in a panini press (genius and dank). After spending yesterday tasting the wines of Portugal, our plan today was to drive into the heart of the Douro Valley, the source of all of those grapes. We started by following the meandering Douro River out of Porto; as the frenetic city fell behind us, the terrain changed and we soon were surrounded on all sides by lush, terraced rolling hills of vines. Meanwhile, the Opel Corso was anything but impressed with the terrain. The hairpin turns, coupled with the steep climbs, had her gasping for air as our RPMs sat just underneath the red line. Unsurprisingly, the check engine light soon came on. Charlotte turned to me. And we did, soon turning onto the long driveway of Solar de Rede — a pousada (state-run) hotel just outside of a town called Mesão Frio — that was housed in an historic old building with impressive views all around. We spent the rest of the day at the pool, soaking in the 90-degree temperatures and picking our lunch — a handful of free Valencia oranges — right from the trees. As the sun began to set at around 9 p.m., we cracked open a bottle of red wine, snacked on some jamón and took it all in. We both agreed that, indeed, this wouldn’t be a terrible place for the car to die. This city’s love affair with wine — and specifically, the namesake port — dates back to the 18th century. 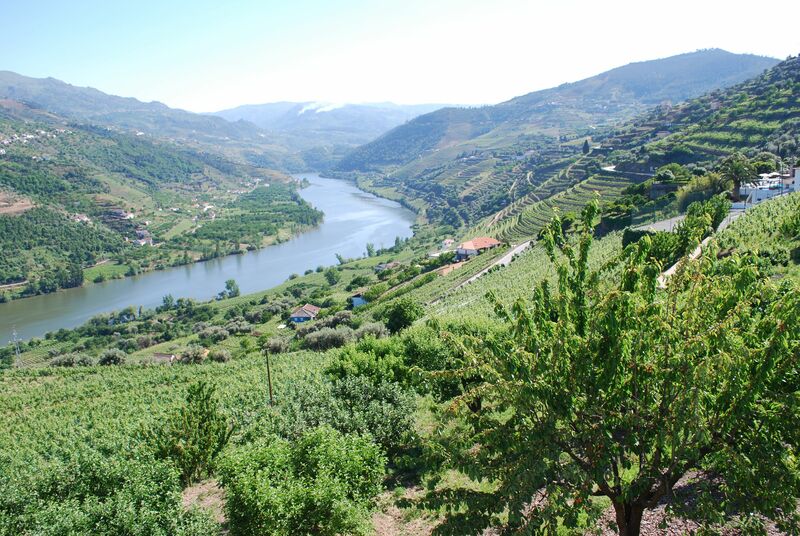 Grapes grown in the Douro Valley, an area blessed with just the right mix of rain, soil composition and sunlight, were cultivated and brought into Porto by boat, where they were processed and subsequently aged. On the other side of the river, in Villa Nova de Gaia, about 60 lodges continue to make port this way today. This morning, with the sun shining again, we set out to do some tasting. Our first stop was the smaller, independent Cálem, that wasn’t running another English-speaking tour for an hour, but had a Spanish speaking guide available immediately. Which meant it was time to brush off those Español skills. Port itself is made in about the same way as wine, with the key differences being length of fermentation as well as the other ingredients, like brandy, that are occasionally added. We got to check out the oak barrels, where porto had been aging for 10, 20, 30 years or longer. Then, to the matter at hand: tasting. For those who haven’t imbibed, port is a sweet dessert wine, best enjoyed in limited quantities, like, well, a glass. The older the port, the lighter the color and more refined the taste (apparently). With a few tastes under our belt, our next stop was Ramos-Pinto, another quiet spot where we had a chance to taste most of their line, including a delicious 20-year old reserve. Two tastings were really enough for us, so we made our way back along the shore, checking out the old boats used to transport grapes into the city — and now largely to haul camera-totting tourists around. With the weather approaching 32 degrees, we needed to escape the heat and our hotel recommended a popular beach just about 20 minutes away. Checking out all the Europeans sunning themselves there, it felt only appropriate to don my new Euro suit (courtesy of C&A). It took a little while to get used to but I’m now quite sold on the benefits of the Euro suit! Needless to say, Charlotte got a kick out of it, too. We spent an hour driving from Luso to Porto, the country’s second largest city, and then about the same amount of time desperately trying to follow Google Map’s complicated directions down narrow one-way European streets. Finally, we found Eurostars Das Artes, parked the car, checked in and set out to explore the city. The last few days have brought unseasonably warm weather to Portugal, which sounds great — until you realize that Porto is built on one giant hill. We started by climbing the Torre dos Clerigos, a 225-foot tall tower (tallest in Portugal) designed by Italian Nicolau Nasoni in the mid 1700s. From its top, we took in the sweeping views of the city and the Rio Douro before Charlotte had a minor panic attack and we quickly descended. After a pricy burger at the city’s best café, Majestic, and some window shopping along the pedestrian drag, we stopped at the Sao Bento Train Station, completed in 1903 and showcasing some 20,000 painted azueljos of historic scenes. Nearing the river, we passed the former stock exchange and made our way into the Ribeira district, a zone of winding lanes, tiled churches and cobble-stoned streets lining the riverfront. A beer was needed before tackling the climb back uphill to the hotel, towing shopping bags from C&A (second favorite European department store after Corte Inglés). Back at Eurostars, we searched for a truly local haunt for dinner and found a small outdoor café. Nearby, two women were wolfing down the day’s special, which without really knowing what it was, we ordered. How about a puff pastry encased hotdog covered with cheese and special sauce? Yeah, it hit the spot. Today’s goal was to make our way northward — but not without several pit stops along the way. Cruising up the A2, we learned why this country’s roads are so well-maintained: exorbitant (and frequent) tolls. Our first was about 4 euros, which at the time seemed like a lot, although it wouldn’t once we had some more kilometers under our belt. About an hour north of Sabugo was Obidos, a small village of about 3,000 residents sitting inside the remains of a castle wall. There were lots of whitewashed houses, accented with vibrant blue and yellow paint. Unfortunately, the town itself caters largely to tourists, with most overpriced shops offering porcelain, lace and Portugal shot glasses. We headed to walk those 13th century castle walls — which without hand railings and its uneven cobble-stone paths, meant balancing precariously close to the edge. Thirty minutes later, we were in Alcobaca, home of the country’s most prominent Unesco World Heritage Sight. The Mosteiro de Santa Marie was founded in 1153 by the first king of Portugal. The surprisingly quiet cloister offered a momentary respite — no tour groups — and for a minute, we could almost envision the silent monks shuffling around among the soaring carved archways and weighed-down orange trees. After a light lunch, it wasn’t much further on the A2 to Batalha, with its own impressive abbey (Mosteiro de Santa Maria da Vitoria) that dates to 1434. Here, we found the stained glass windows were the real draw. Feeling a bit mosteiro’ed out, we cruised another 90 minutes north to Luso. In the middle of the Bussaco Forest, we arrived at the Palace Hotel do Bussaco, a palace originally built in 1907 as a royal summer retreat on the site of a 17th century monastery. Now, it’s been converted into a hotel, complete with rose garden, period furniture, spires and turrets. Outside, our Opel Corsa fit right in. Can’t you imagine it next to a horse-drawn carriage a hundred years ago? We splurged on dinner at the hotel’s restaurant — an absurd 7-course affair complete with a salad trolley and grilled wild boar with garlic and rosemary. We felt like royalty. At least for a night. Sintra, set among mountains, forests and the sea — with its intoxicating combination of quaint and magical — is one of this country’s must-see cities. With the sun shining, it was only about a half hour drive from Cascais to our hotel in the neighboring town of Sabugo. When traveling, many factors — location, cost, amount of mid-century-modern furniture in the lobby, etc. — go into deciding where I’d like to stay. This, I’m excited to report, is the first time that I’ve picked a hotel based on its name alone. While it took some careful navigating to locate, we soon found ourselves at the door of “The She Pine Tree House Hotel,” a small bed and breakfast. We were greeted by one of the friendly owners, Luis, who brought us into the bizarre living room, decorated with just an overwhelming amount of stuff. Drawings, books, pillows, plants, overload. With a big day in Sintra planned, there wasn’t much time to take it all in, so after dropping off our bags, it was back in the car. Twenty minutes later, we were in the heart of the old town, dodging massive tour groups all jostling for entrance to the Palacio Nacional de Sintra. Of Moorish origins, the palace dates to the early 13th century and is best known for its conical white chimneys. It houses quiet courtyards filled with orange trees, some of the oldest azueljos (relief tiles) in the country and the Swan Room, adorned with Manueline frescoes of 27 gold-collared birds. The crowds were a bit much to handle, so we made our way through rather quickly and then embarked on our climb to Castelo dos Mouros, a mist-enshrouded ruined castle from the 9th century. Rising 1,200 feet above us, the walk was a bit intense, although we felt more deserving of the experience than those bus-bound other tourists. From the Great Wall of China-esque walls, we spied the Palacio Nacional da Pena sitting on a nearby hill. Passing through a park of the same name, we hiked to the entrance and, after a quick lunch of warm goat cheese salad, were completely blown away. While the colorful and detailed exterior was impressive, it was the interior where this palace really shone. Room after room featured centuries old porcelain, furniture and oil murals. It was as if Queen Maria II, for whom the place was commissioned around 1840, was still living there. Continuing on our palace binge, we hopped in the car for one last stop that our hotel keeper said should not be missed: Quinta da Regaleira. This villa was built in 1892 for a Brazilian coffee tycoon who clearly had a thing for crazy carved stone structures. Back in the Corsa, our whirlwind day in Sintra continued west to the sea. Cabo da Roca, a sheer 450-foot cliff, is the westernmost point in Europe, and as Charlotte so acutely pointed out, I’ve got a serious need for geographical tourist sites. Back at House of She Pine Tree, Luis made a nice home-made meal that we enjoyed with some of the other guests before retiring to that bizarre living room with a carafe of red wine. With a slight headache, we caught a taxi to the airport this morning to pick up our rental car. Neither of us can drive stick, which left limited options. In fact, only one agency (a German company called Sixt) had a car to offer — a hot blue Opel Corsa 1.2, an engine, we would learn, that might have had another life in a tractor or lawn mower. Our destination for the day was Cascias (pronounced Kush-kaish), a town that has skyrocketed from sleepy fishing village to a popular summer destination for the residents of Lisboa. In most major capital cities, escaping to the beach and ocean can make an afternoon’s drive. In Portugal, it takes about 30 minutes to reach the Costa del Sol. We parked and checked into Hotel da Vila, a super colorful place in the heart of the old town. The receptionist pointed us toward a lively pedestrian drag nearby where we found a touristy seafood restaurant with outdoor seating. A grilled piece of swordfish and bottle of water later, my hangover had magically vanished. An Audi-sponsored regatta race was wrapping up on the waterfront, so we walked down to the shore to check it out. Charlotte, with her impeccable fashion sense, wore just the right outfit. Although town and the marina was bustling, many of the shops were closed since it was Sunday. So we settled for walking around, resting with gelatos on benches and enjoying the warm sun. Our dinner at a local Thai place was questionable — was there tomato sauce in our pad thai? — best to just stick with the local cuisine. But sunset drinks at the uber-trendy Farol Design Hotel, with its whack chandelier and sweeping views of the Atlantic, proved the perfect nightcap. After a solid 12-hours of sleep, we were up early this morning to take Tram 15 into the city center. We had two strong bicas and a pastry at Confeitaria Nacional, a pasteleria that has been around for a couple of years (well, since 1829). At this early hour, it — as well as the surrounding Praca da Figueria — was just waking up. Outside, we hopped onto vintage Tram 28, for a rambling ride up one of Lisbon’s many hillsides to Miradouro da Senhora do Monte, the city’s highest lookout. From this vantage point, we could take in the red tile rooftops, the Golden Gate-esque bridge crossing the Rio Tinto, the tolling of church bells. Essentially, Lisbon. It was hard to overlook the iconic Castelo de Sao Jorge sitting on a nearby hillside, so after quick stop at the Saturday morning Feira da Ladra market, we made our way in that direction. The castelo dates back over 1,600 years. It was used by the Visigoths in the 5th century, Moors in the 9th century and royals in the 14th to 16th centuries. We explored the shaded courtyards, cobble-stoned streets and towers, staying far from the unprotected edge. Back outside, we got lost among the Alfama district’s back alleys and unmarked streets. This is an area that shows working-class life in the country’s capital, with old women hanging laundry to dry and children playing in the small, leafy squares. We managed to find the Sé, the fortress-like city church built in the 12th century, that was still decoratively festooned from a visit a few days ago by the Papa. It was time to refuel — and our guidebook suggested Pois Café, an Austrian-run neighborhood spot with a kind of Village bohemian feel to it. After a couple of sandwiches and Coke Lights, we continued descending downhill until we hit the waterfront and sprawling Praca da Comercio. Deciding where to head next, we realized that our city map was sponsored by El Cortes Inglés, the amazing Spanish department store that required a visit. A short metro ride brought us to the 8-story behemoth, where we ended up buying a nice vino roja, freshly baked rolls, goat’s cheese and Jamón ibérico to snack on later. The dish of choice was an essentially “grill your own steak.” Ingredients: raw filet, salt, seasoning and a hot as heck stone. Result: Completely delicious. In the center of Lisbon’s social scene, we hit several (many) of Bairro Alto’s bars, staying out too late and more than making up for last night’s weak performance. With the threat of another ash cloud shutting down Europe’s airports having temporarily subsided, we boarded our flight for Portugal a little after 8 p.m. US Airways was flying a jet from what felt like 1980, with seats crammed into every space and no entertainment options (three old school televisions hanging from the ceiling). Still, the flight was cheap and left on schedule. We arrived in Lisbon just about 6.5 hours later, at 8:25 a.m. local time, not having slept much thanks to the talkative family sitting behind us that was oblivious to the fact that maybe other passengers might want to get a couple minutes of sleep. At the carousel, my bag was possibly the last off – but thankfully made the connection in Philadelphia. We hopped in a cab for the 20-minute ride to our hotel in Belém, a pretty, seaside neighborhood on the city’s outskirts. Our room at Jeronimos 8 was on the small side, but we didn’t anticipate doing much in it besides sleeping, so it was fine. Plus, the lobby had a lounge-like space and there were some recliners outside on the patio for us to chill out on. Battling jet lag and a line snaking out the door, we started our morning at Antiga Confeitaria de Belém, a bakery dating to 1837. It’s best known for the pasteis de belém, crispy pastry shells filled with custard cream, baked at 400 degrees then doused in cinnamon and powdered sugar. After demolishing four of them and some bicas (espressos), we were tempted to order another round but held off. Just down the block was Mosteiro dos Jerónimos, which was commissioned to commemorate explorer Vasco de Gama’s discovery of a sea route to India in 1498. The first monastery of many that we’ll visit in this country, it was impressive, with intricately carved stone columns (that Charlotte loved) and a serene cloister which monks used to cross in silence. A short walk to the shore, we visited the Padráo dos Descobertas, a monument inaugurated in 1960 on the 500th anniversary of Henry the Navigator’s death. Standing 150 feet tall, it features all of those textbook explorers that departed not far from here, including da Gama. Passing fishermen, we walked further to the Torré de Belém, a World Heritage-listed fortress that epitomizes the Age of Discovery (according to Lonely Planet). It was built back in 1515 and has survived the years to offer tourists like us panoramic vistas of the sea today. With the lack of sleep starting to catch up on us, we blazed through the Museu Coleccao Berardo, a free contemporary art museum with some bizarre exhibits, and the Museu Nacional Dos Coches, a sweet place with a huge collection of dank old school carriages, including some seriously blinged out rides. Back at the hotel, we decided to take a nap. It was around 5 p.m.
Little did we know that we wouldn’t awake until the following morning. Marc is the co-founder and CEO of AcceptU, an edtech company based in Boston.